More on path dependency: describing the past is not endorsing the past…but these are the facts, like ’em or not. I’ve apparently managed to confuse some people in my post yesterday about federal government spending and taxing as a share of the economy. Though to be fair to myself, always a good practice, it looks to me like those people a) don’t read my stuff (unforgivable! ), or b) don’t want to face historical facts. 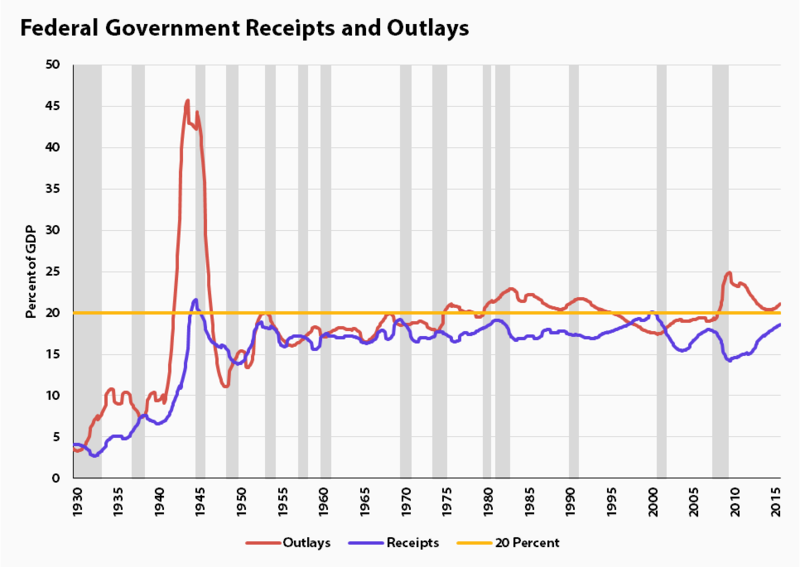 First, reviewing those facts, I’ve got historical data from OMB on federal receipts and outlays as a share of GDP since 1930, which I’ve plotted below, along with a line at 20%, the rough avg for both series. The WWII spike is obvious and you should also note the spike at the end as we, including yours truly, temporarily expanded spending to fight the Great Recession. But outside of wars and downturns, the range is as you see it. That does not and should not—I’d say must not—restrict the future. A key point of my work is that when it comes to our fiscal future, we mustn’t succumb to the tyranny of the historical average. I’d urge those who are unaware of this to dig much more deeply into my scribblings before concluding that describing the past is the same as endorsing the past. But continuing this description of the way things are—this is the path dependency point from yesterday’s post—check out this OECD figure on tax receipts as a share of GDP by country. This includes both federal and state spending, as it should. Those progressives who both discount path dependency (not me) and want to see us move up in that chart (yes me!) believe we can or at least we should fight for jumping from the bottom to closer to the top. As I wrote yesterday, go for it! I’m not the chin-stroking, finger-waggling pundit saying “give up, you’ll never get there!” And it is glaringly obvious to me that for lots of reasons, we will need to raise more revenues to meet both demographic and a whole set of other challenges, including climate, poverty, immobility, infrastructure, health care, retirement security, and more. I’m just more path dependent than you are. That doesn’t mean we have to stay on the path we’re on, Buddha willing. It does mean, to me, that the better path with true access is in the same general part of the woods as the current one. Share the post "More on path dependency: describing the past is not endorsing the past…but these are the facts, like ’em or not." 9 comments in reply to "More on path dependency: describing the past is not endorsing the past…but these are the facts, like ’em or not." The US has federal, state, and local taxes. The total is significantly higher than just federal taxes. Other nations I assume have a different tax structure. I think that when comparing nations, one should include all types of faxes, from all levels of government. State sales taxes, local real estate taxes etc. are subsidized either totally or heavily by federal taxes, for most people. 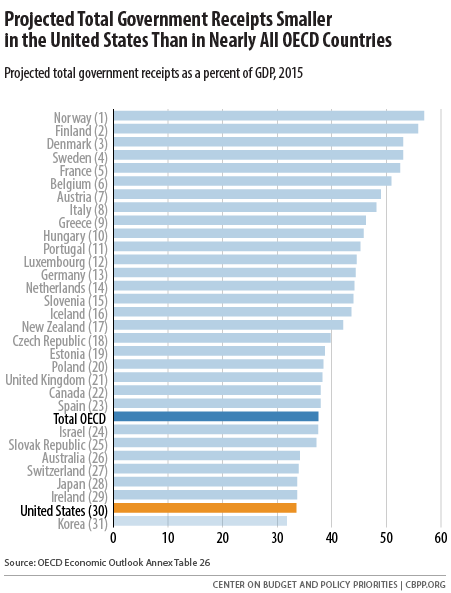 OECD caption says “Total Government Receipts” which is about 33% of GDP and Jared’s plot for just Federal has about 20%, so that leaves 13% for the state and local. So the bottom plot is comparing apples to apples. The path we are on has lots of potholes and this plot shows why. There is a reasonable possibility that taxes paid by the wealthy will be used for the general welfare. There is little possibility that taxes cut for the wealthy will be donated to improve public services. Since you will never eliminate greed, increasing the former at least gives us a chance for a better America. But how taxes are spent has caused opposition. Fraud is a narrative used to sway public opinion against public ownership and operation. Who can blame the middle class when taxes are often used for useless contracts, corporate payoffs, promoting monopolies – all of which could be ameliorated by leaders not tainted by private money to seek or keep office? Moving to effective government depends first on campaign financing reform. That requirement explains the “establishment’s” fear of Sanders and Trump – a socialist and a capitalist – both seeking a fundamental change in how we might pick honest leaders by eliminating the control of politicians by some of our richest citizens and their interests. Thanks for this post, Jared. I’m more path independent, which does indeed come with risks. I would be open to hearing how staying in the general area of the habitual confines of these quantities can lead to bring the average African-American household net worth of $10k up to the average American household net worth of $170k (still too small). But I don’t hear the presumptive Democratic nominee giving a serious address of this problem. Are we on a path or in a rut? We jumped from 1930 to 1945. We can do it again. It’s not really that hard; it’s just a change in the government budget. Single-payer health coverage would destroy health insurance companies, but everyone hates those guys and they’re a small percentage of the economy. When I look at path dependency, I think of a different example: the 30-year mortgage. They’re a terrible idea economically (it’s way too long a loan, longer than the depreciation schedule for many of the houses), and they were put into place as an emergency measure during the Great Depression. But with *so many people holding 30 year mortgages*, and an entire *sector of the economy* built around them, and a *very large sector* where downturns are linked to total economic downturns, I don’t see how we shift away from the 30-year-mortgages without utter economic destruction. Now there’s a case of serious path dependency, and feel free to use it as an example. The 30 year mortgage enables people who aren’t rich or possessing family wealth to buy houses. The only houses that are worth zero in less 30 years are the ones the banks foreclosed, creating homeless people, economic basket cases with ruined credit, lower surrounding property values, delayed recovery, vandalized houses, mini-Detroits, and finally a source of hedgefund profit gouging. Only Fannie Mae and Freddie Mac keep 30 year loans in existence, but the banking industry wants to eliminate them. Meanwhile the banks make huge profits, charge 20% interest on consumer credit, and pay billions in fines which is not even a wrist slap. I find it helpful if people are able to actually see the problem we must face.